With the economy on an up-turn, many companies are experiencing steady growths – with an increase of raw materials and accruing SKUs of finished goods. Material handlers in both manufacturing and distribution industries are making efforts to keep up with a variety of package forms current consumers are driving. Additional SKUs and lighter packaging can become problematic due to limitations in bulk stacking and the need for more put-away locations. Floor stacking bulk alone, just doesn’t do the job anymore. Many raw material and finished goods bulk areas are yes flexible but often square footage is under underutilized due to too many SKUs or inadequate stacking ability. There are an array of different options available to warehouses to utilize cubic space. Over the last decade, a serious increase in automated and semi-automated bulk storage systems have been introduced and are being strategically used throughout the material handling world. Many companies have introduced a form of automation to increase productivity, and reduce the overall footprint. The need to maximize cubic space is essential when expanding a current facility, or moving to a new one is a costly option. In this article we will uncover the top 5 reasons to consider a Pallet Shuttle Deep Lane Storage and Retrieval system. Storing fast moving bulk product in floor stacks is optimum for flexible put away and retrieval. What do you do with the slower movers and how do you control FIFO in bulk stacks? Slow movers are usually stacked in smaller areas placed in bulk replenishment areas of the warehouse. When more volume and multiple SKUs are introduced to floor stack areas, inefficiencies in pick flow and extensive storage honeycombing greatly reduce space utilization. When FIFO is required and slow moving bulk is located in floor stack areas, these areas usually have to be unloaded before new date codes can be introduced. By implementing a Deep Lane Pallet Shuttle Storage system, bulk storage areas lanes can be flexible and level of the system can store different SKU while easily managing FIFO. Deep Lane storage can be configured for as deep as a warehouse and throughput will allow while providing aisles at only the put-away and/or retrieval side of the storage medium. The space gains and reduced labor can greatly enhance overall profitability of a bulk or cold storage warehouse operation. Warehouses today have an average ceiling height of about 20′-35′. 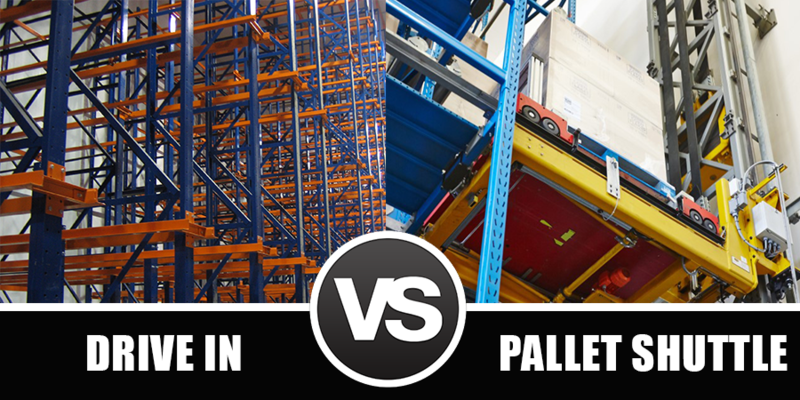 The ability to stack pallets in the bulk areas are limited by the clearance as well as pallet weights. By integrating a Pallet Shuttle Deep Lane Pallet Shuttle storage system, a warehouse storage space footprint can be reduced by up to 50% by virtually turning a bulk storage area on its side and creating a flexible option to go as deep as needed. This option eliminates the need of multiple access aisles down to one or two. This reduces the need to have multiple lift trucks operating in an area thus immensely reducing labor costs. Cold storage facilities can reduce energy consumption by over 60% by creating a more confined space to be cooled with the Pallet Shuttle application. The variety of lighter packaging, heavier products and bulk items with overhang, are creating challenges in manufacturing and distributions operations. What used to stack 3-4 high, can now be stored only 1-2 high which greatly reduces overall storage capacity. Lightweight packaging can cause damage by buckling under the weight of a mere two to three high stack. When product succumbs to crushing, it can make it very unsafe for operators to move around the unstable stacks causing a slight bump to turn into a life threatening event. Deep Lane Pallet Shuttle storage is designed for single high units per lane to be stored very high and deep. The Deep Lane system is ideal for products like super stacks and products with extensive overhang. The result is an increase in storage capacity and safety, with a decrease in product damage. Often warehouse or manufacturing operations have to handle large quantities of products in storage areas through one or multiple shifts. Flexible floor storage demand that multiple forklifts are used to travel in aisles and then deep into rows. This travel and constant stacking creates high labor and forklift maintenance costs. 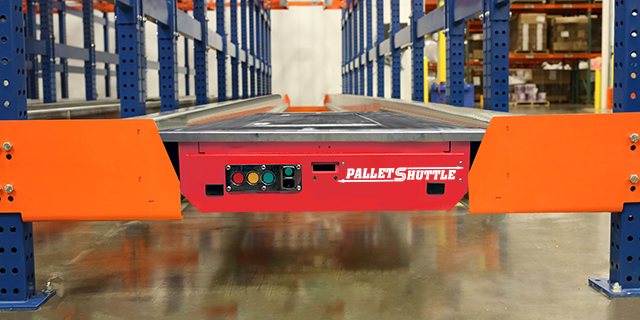 Deep Lane Pallet Shuttle systems offer relief to labor by only requiring one put-away and/or retrieval aisles. All the travel can be accomplished at the dock or main aisles, greatly reducing forklift travel and thus reducing the amount of labor required for each task. In cold storage applications the reduced usage of lift trucks within a freezer can dramatically reduce energy consumption. Average lift trucks operating in a cooler of freezer application can lose up to 50% of battery charge and life cycle due to the temperature. The use of an deep lane storage system such as Pallet Shuttle reduces the need to have multiple trucks operating within a freezer. The Shuttle system contains a high powered Lithium battery that gives it the ability to operate seamlessly in temperatures as low as -20 degrees. 5) SKU Growth of Bulk Storage Items. SKU growth is alive and well in today’s complex supply chain. As SKU proliferation continues, square footage of floor stacked bulk storage areas need to increase in order for SKUs to be accessed independently of each other. By utilizing Deep Lane Pallet Shuttle systems, multiple SKUs can be stored and accessed on top of each other in deep storage and accessed from a single aisle. Getting multiple SKUs condensed in a smaller footprint can greatly increase storage capacity and pick path efficiency in bulk areas. When making a decision about implementing a semi-automated deep lane storage system, take into account the current growth of the SKU’s and plan 2 to 5 years ahead. The investment of a deep lane system is far less than the investment of an entire new facility.